Established in 1988, Ted Baker™ London has grown from its humble roots as a shirt specialist in Glasgow to a global lifestyle brand with over 100 locations in Europe, the US, Australia, Middle East, Far East and Southeast Asia. As "no ordinary designer label," Ted Baker offers menswear, womenswear, watches, and accessories. They are renowned for high quality and a distinctive use of pattern and color. The brand’s unconventional approach to fashion, irreverent sense of humor and, above all, unswerving attention to detail appeals to style-conscious men and women who trust Ted to deliver that certain something... a little out of the ordinary. I usually never have a problem with shoes fitting correctly. These shoes are extremely narrow. It was difficult even getting the shoe on and was extremely tight width wise. A larger size would make the shoe too large overall, so I had to return. I really wanted to like this shoe - looks good, nice fitting, and the longer on the feet the more the leather seemed to mold to me. Unfortunately, the problem came up when walking (the whole point of having shoes I've been told...) the break at the toe was across the base of my big toe and very uncomfortable no matter what I did to adjust it. Have to return these beautiful shoes for something else. 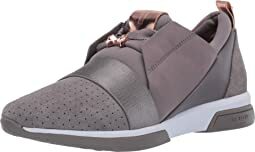 I wrote a previous review, and have since decided to return these shoes. The 8 is just too tight all over, and in the toe box for sure, on my larger foot (almost 1/2 size different) for wearing for comfort and not style. These are cute shoes, but they went back. I say order 1\2 size up if you can. For the short amount of time I wore them indoors they felt comfortable on the smaller foot and looked cute. These shoes are beautiful but they were huge - at least one size too large. Had to return. They didn’t seem like they would comfortable for long walks - but I did not assume they would be. 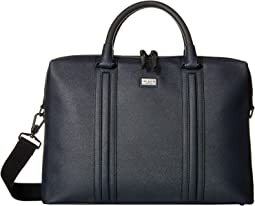 Looks good, I like Ted Baker, they just take a long time to break in. Very nice shoe! 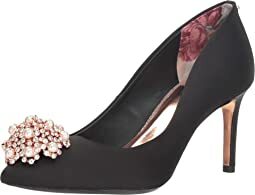 This is my second pair of Ted Baker's...the first ones were very similar to this pair...I couldn't imagine my life without them. They should be part of everyone's collection. I ordered a size 9. Overall, fit and look: A full size larger and narrow. Overall, it was not comfortable fit for me. So, consider ordering a half-size to a full-size down and the shoe is made for a person with narrow feet. These shoes are AMAZING! They definitely run short, though; I’m usually a 10/10.5 and ordered an 11 in these, and they fit perfectly when usually an 11 is swimming (in almost all brands). 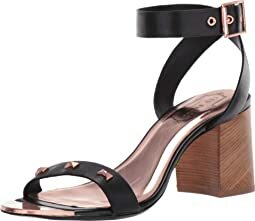 This is exactly the shoe that I was looking for - a comfortable, minimalist, well-made brown sandal with a medium block heel that I can dress up or down and wear with jeans, skirts, dresses, jumpsuits, and rompers! The good hardware and adorable bows on the top of the foot add the perfect amount of sophistication too, without being tacky. Ted Baker for the win with this one. I wanted to like these shoes but in the end I didn’t like how the style looked on and the embellishments were a pain. For the price I had to love them. 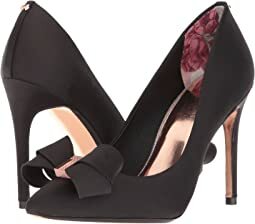 My first experience with Ted Baker shoes. I ordered dark gray in an 8, my regular size. The shoes fit well and are not tight on my high instep or loose in my narrow heel. I will have to wear thinner socks, so if you want to wear an athletic sock you might want to order a half size up. I'm going to switch out the thick bow laces (the rose gold bow bead was a little too much for me) for the included gray laced for a less froo-froo look. These shoes are easy to slip on and off. I haven't worn them much yet but they seem comfortable with a good level of support. I think these will be versatile. Perfect! Bought two pairs. Couldn’t be happier with them. Awesome! They couldn’t be more perfect. I’m thrilled with them. This Ted Baker sweater top is gorgeous! I saw it in Nordstrom and tried it on in the store. The fit and feel was amazing, but it looked like it had been worn and returned to the store. I needed it immediately, so I looked to Zappos to see if they had it (and they did) and received it quickly (as usual, Zappos saved the day and I received it the following day). For reference, I am 5'2" and 105lbs, the size 0 fit perfectly. Show stopper. This could be for dressy or casual. It is a fun pop of color. I love it. It had a rose gold chain to use if you’d prefer. I’m going to use this casually too. White T-shirt, jeans. It’ll be a great accent piece. I love it! Super soft and luxurious the broach gives it a look ! The heel was perfect for me love love love these shoes ! 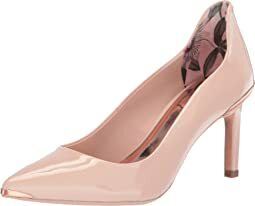 The only problem now is that I want all the same exact shoes the same heel size the same pump in all the colors!